Long-haired Chihuahuas require routine grooming to keep them looking and feeling good. Fortunately, this little dog‘s needs are not extensive and owners only need to perform most of the tasks about once a month. Since many of these small dogs come with big attitudes, it is best to begin the grooming process when they are young, so that they become used to the routine and don’t protest as much when they get older. For many owners and their long-haired Chihuahuas, grooming time helps them to bond and get closer. 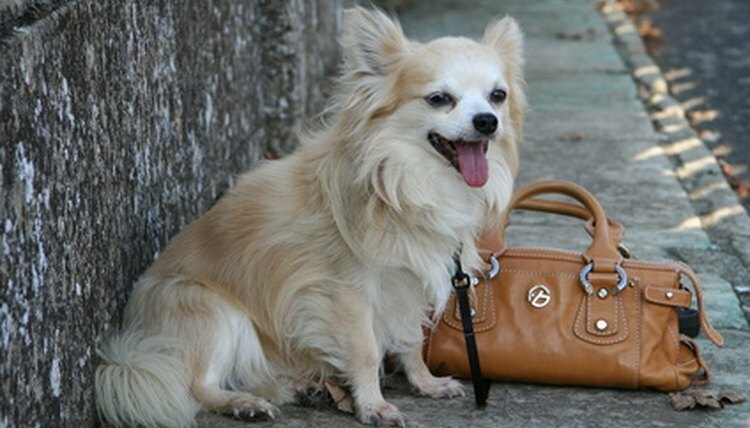 Brush your long-haired Chihuahua at least once a week with a pin or slicker brush. This breed’s long, fine hair can become knotted or tangled unless it is brushed on a regular basis. Brush your Chihuahua’s teeth at least once a week with a toothbrush and toothpaste that is made for dogs. A Chihuahua’s small teeth can build up plaque and tartar quickly. This bacteria can spread under the gum line and enter the dog’s blood stream, which can cause a variety of problems, including heart disease. Prevent this from occurring by keeping your Chihuahua’s teeth healthy and clean. Trim your Chihuahua’s nails at least once a month. Chihuahua nails have a tendency to curl under their feet and grow into the paw pads if not kept short. A good rule of thumb is to trim the nails whenever you hear them tapping on your floor, which usually occurs about once a month. Bathe your long-haired Chihuahua once a month, or as needed. Chihuahuas are typically clean dogs and only require baths on a monthly basis, unless they get extremely dirty. Use dog shampoo and be sure to rinse all of the shampoo off of the dog when done, or else it could irritate the skin. Wrap your Chihuahua in a towel to dry it off and use a blow dryer to dry its hair, if desired. Trim your Chihuahua’s hair, if desired. Some owners use scissors to trim the backs of the legs, stomach areas and tails if their dogs tend to mat. Trim the hair as short as you would like; however, take care not to cut the dog’s thin skin with the scissors. Clean your Chihuahua’s ears at the same time as it receives a bath. Pour dog ear cleaner in the ears and massage the base of the ears to loosen any wax or debris. Use a cotton ball to wipe out any material in your Chihuahua’s ears.